O God, who raised up the Priest Saint John Bosco as a father and teacher of the young, grant we pray, that, aflame with the same fire of love, we may seek out souls and serve you alone. Through our Lord Jesus Christ, your Son, who lives and reigns with you in the unity of the Holy Spirit, one God, for ever and ever. Don Bosco, Seeker of Souls | Msgr. Paul E. Campbell M.A., Litt.D., Ed.D. St. John Bosco was the founder of the Salesian Society, named in honor of St. Francis de Sales, and of the Daughters of Mary, Help of Christians. His lifework was the welfare of young boys and girls, hence his title, "Apostle of Youth." He had no formal system or theory of education. His methods centered on persuasion, authentic religiosity, and love for young people. He was an enlightened educator and innovator. John Bosco was born near Castelnuovo in the archdiocese of Turin, Italy, in 1815. His father died when John was only two years old and it was his mother Margaret who provided him with a good humanistic and Christian education. His early years were financially difficult but at the age of twenty he entered the major seminary, thanks to the financial help received from Louis Guala, founder and rector of the ecclesiastical residence St. Francis of Assisi in Turin. John Bosco was ordained a priest on June 5, 1846, and with the help of John Borel he founded the oratory of St. Francis de Sales. At this time the city of Turin was on the threshold of the industrial revolution and as a result there were many challenges and problems, especially for young men. Gifted as he was as an educator and a leader, Don Bosco formulated a system of education based on "reason, religion and kindness." In spite of the criticism and violent attacks of the anti-clericals, he conducted workshops for the tradesmen and manual laborers, schools of arts and sciences for young workers, and schools of the liberal arts for those preparing for the priesthood. In 1868 there were 800 students involved in this educational system. To ensure the continuation of his work, Don Bosco founded the Society of St. Francis de Sales (Salesians), which was approved in 1869. Also, with the help of Sister Mary Dominic Mazzarello, he founded the Institute of the Daughters of Mary Auxiliatrix. In 1875 a wave of emigration to Latin America began, and this prompted the inauguration of the Salesian missionary apostolate. 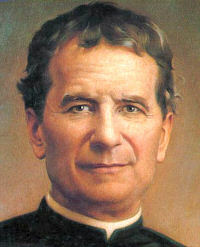 Don Bosco became a traveller throughout Europe, seeking funds for the missions. Some of the reports referred to him as "the new St. Vincent de Paul." He also found time to write popular catechetical pamphlets, which were distributed throughout Italy, as was his Salesian Bulletin. This great apostle of youth died on January 31, 1888, and was canonized by Pope Pius XI in 1934. Pope John Paul II named him "teacher and father to the young." Patron: Apprentices; boys; editors; Mexican young people; laborers; schoolchildren; students; young people. St. John Bosco at a young age learned how to juggle and do other tricks to attract children to him. This provided opportunities for him to give catechesis to these children. Think of different activities that you could do to attract children—perhaps juggling, putting on puppet shows, storybook time—and use that opportunity to teach a virtue, catechism lesson, or just to be a good example. Good clean fun or a wholesome activity is a lesson in itself in a world where there is so much corruption. If you feel brave, try cooking the stuffed raw peppers suggested for today. Mama Margaret probably cooked Peperoni farciti à la Piemontaise (peppers stuffed with boiled rice), a speciality from Turin, for St. John Bosco's boys. Read this article from Catholic Culture's library, Don Bosco, Seeker of Souls.